Our iSolved technology presents Employers and Employees with a unique advantage allowing them to experience true single sign on capabilities. Employers recieve a single login to access Payroll, HR, Timekeeping and Employee Benefits without ever leaving the system. Employees can access paystubs, W-2s, update personal information, enroll in benefits and more using their single login. iSolved allows companies to scale into new products as their company grows. With iSolved, companies never get moved into a “new” version. With our unique “role and access” levels, we can enable and disable different modules in your environment. This allows companies with 1 employee or 10,000 employees to customize their needs without leaving what users know. iSolved offers hundreds of standard reports ready for users the moment they login. iSolved also provides a robust user friendly report writer module. Customize and built reports, exports and more from our easy to use interface. Build custom formulas, filters and more or keep it simple and select from thousands of fields ready to be used. With iSolved our security contains a multi level facet designed to keep your data on lock down. Two-Factor Authentication, Data Segregation, Disaster Recovery and more are all parts of the vigorous security . Click here to learn more about our security. 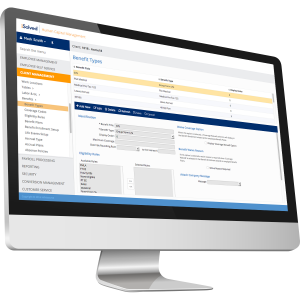 With our iSolved HCM module, integrate payroll, benefits, hr and more without ever leaving the system. Our HRIS provides you the power that even the most versatile HR Department needs. Performance reviews, asset tracking, education, certification, disciplinary actions, employee document tracking and more. With iSolved HR Staff can get rid of the dusty folders and experience true efficiency. Do you have high turnover or going through a growth spurt? With iSolved Hire and iSolved Onboarding companies can streamline their applicant tracking system and employee onboarding. Customize the applicantion process and recieve real time metrics showing where applicants drop off. Design a workflow process that alerts different hiring staff of specific stages. Ready to hire? With a click of the button send an onboarding request to the employee and start collecting employee and company specific documents such as W-4s, WOTC, I-9s, Employee Handbooks and more. Our robust iSolved Time & Attendance allows Companies to design a workflow process that works just for them. Choose from multiple timecard verification levels, IP restrictions, editing capabilities and more. Add even more power by combining our scheduling module to see real time overlays for time worked vs time scheduled. Monitor special alerts, such as missed schedules, from our easy to use dashboard. Do you need to allocate time to different departments or projects? Use our custom Organization Table to design an allocation workflow specific for your needs.